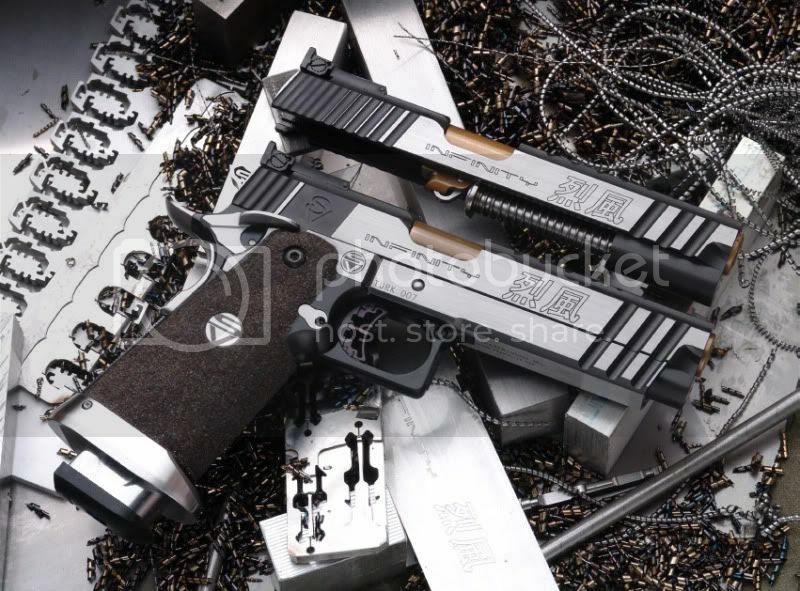 Lots of new 1911 models today. - Two tone Government with markings "Custom Built for Ray Chapman" "International Combat shooting world champion 1975" "Pachmayr combat special"
I want that 5" Kanji Infinity! does dentrinity stock new WA's the quickest? can you buy from WA directly? Oh yeah. I didnt see the 6" single stacker hybrid or other silver IEDs. Or the the two tone S&W and the new Uzi variant. WA is copying HK's custom gun now? I think WA copied it from SVI official website. if you mean the choice of characters, Prime used those since the SCW2 days. And that 5" SVI with the kanji engraving and xcelerator fluting is a real looker too! Have to agree - After WA spent a lot of time on their M4 GBB rifle, it's nice to see a swathe of (at least partly) interesting new pistols. Looks like a Magpul PTS M4 factory from WA? The prices are crazy, though. Does anyone think a stock WA is really worth $350+ dollars?